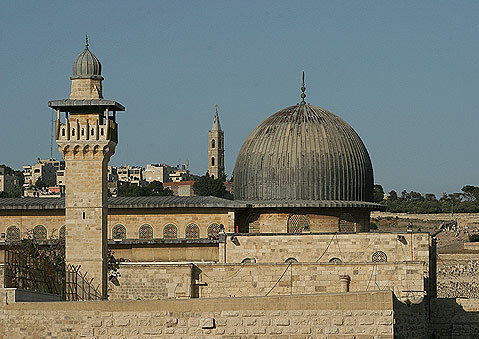 Masjid Al Aqsa is considered third most Important religious place of Muslims after Masjid Al Haram Makkah and Masjid Nabwi Madina. 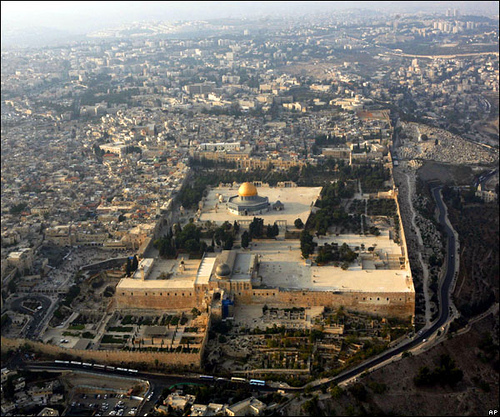 Masjid Al Aqsa was also the first Qibla of Muslims before Kaabah. 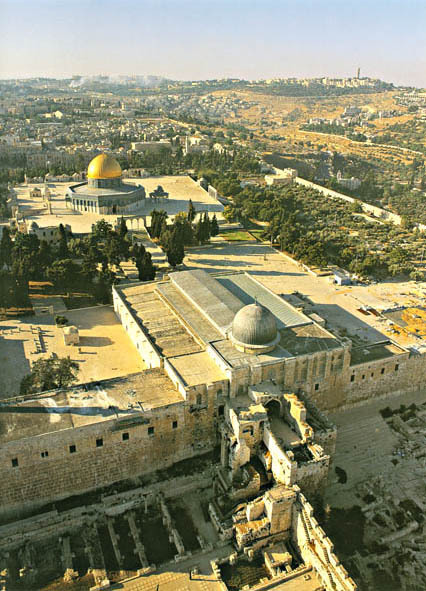 Today Masjid Al Aqsa is Occupied by Israel and whenever Israel wants it stops Muslims from offering Prayer in the Masjid Al Aqsa. Masjid Aksa is presently a 40 acre (approx) platform which is also known as Bait Ul Muqaddas. 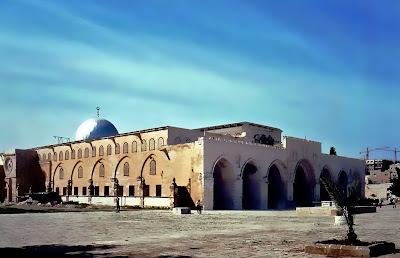 (Masjid Al Quddus by Arabs). When Allah has blessed the place it becomes Haram sheriff. 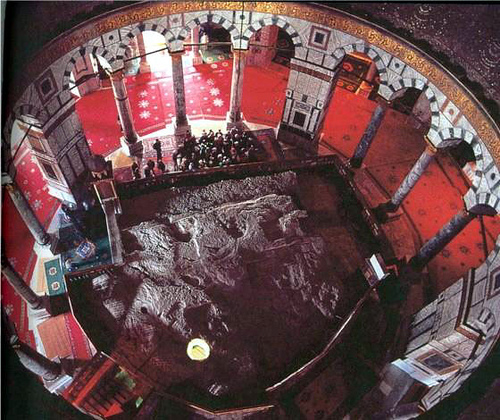 In the centre of Bait Ul Muqaddas is QUBBAT AS SAKHRA, MAQAM A SAKHRA in urdu (Dome of the rock in english) which is a stone slab. ALLAH MADE THIS OUR QIBLA AWWAL. 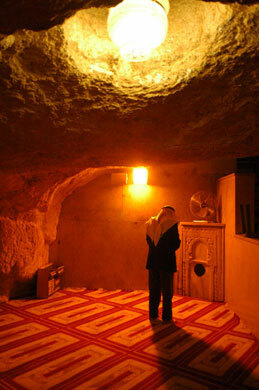 MAQAAM A SAKHRA is a small cave where the Many Prophets of islam used to pray and rest. MAQAAM A SAKHRA was the QIBLA of many PROPHETS including Hazrath Dawood Alhi was salaam, Hazrath Suleiman Alhi was salaam, Hazrath Moosa Alhi was salaam, Hazrath Ilyas alhi was salaam and Hazrath Ibrahim alhi was salaam to name a few. In Isalmic history Hazrath Dawood alhi was salaam was the first Prophet to construct a Mosque at Bait Ul Muqaddas. Hazrath Suleiman alhi was salaam, later expanded this with the help of jinns. He built a raised Platform with huge stone blocks with Maqaam a Sakhra as its centre. Hazrath Moosa alihi was salaam was also commanded by Allah to make Maqaam a Sakhra his Qibla. And he build a Grand Mosque around it. This GRAND MOSQUE was first Destroyed by Firoun of Egypt and later by the Romans, Byzantines, Christians and other invaders. On the night of Meraj Our Holy Prophet Huzoor Sallalahu Alhi Wa Sallam led the prayers facing Maqaam a Sakhra as KAABATULLAH had not yet been made the Qibla. 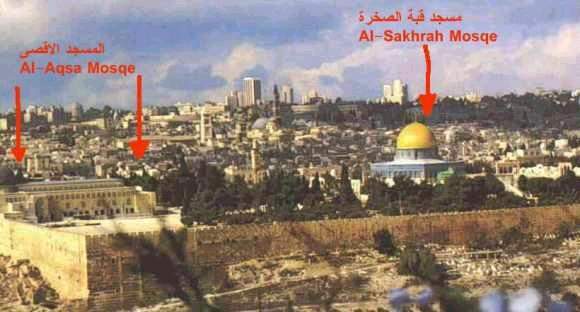 During the Kilafat of Hazrath Umer Farooq Raziallah Anhu, Palestine (present day Jeruselam) was for the first time conquered by the Muslim army. He immediately started searching for the sacred site. the Chapel of Ascension at Mount Olive where Prophet Isa (Jesus) stood before he was lifted to heavens by God. All he saw was a huge pile of debris, Hazrath Umer Farooq Raziallah Anhu looked around for Maqaam A Sakhra, he saw the stone slab under the pile of debris,he recognised the same as it had been described by our Holy Prophet Sallallahu Alhi Wa Sallam. He removed his cloak with which he cleaned the area.The Muslim army cleared the whole area with great respect and looked at Hazrath Umer Farooq Raziallah Anhu as to what he would do next.He stood in the small cave and facing KAABATULLAH bowed down in Prayers. 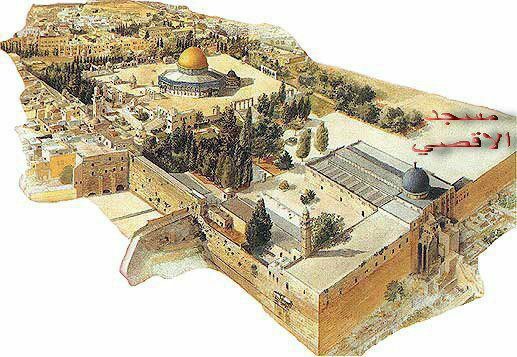 Accompanied with the other Shaaba he looked around for a suitable place to build a Mosque in the vast platform and ordered a Mosque to be built with the Mehrab on the SOUTHERN side of the platform since Palestine is to the north of Mecca. And a Mosque was constructed. Sultan Malik ibn Marwan later expanded the Mosque and also constructed a beautifull Golden Dome on top of Maqaam A Sakhra. 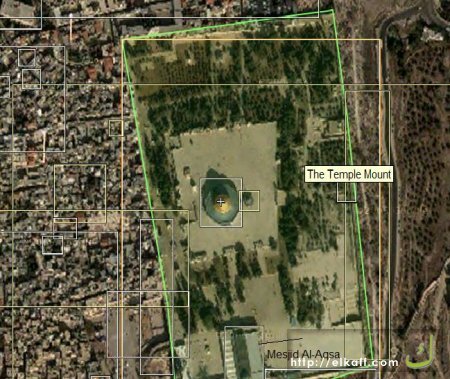 The Crusaders invaded Palestine and destroyed much of what Sultan Malik ibn Marwan had built.The Christians placed a cross on top of the dome. The Mosque was converted to a Church. Sultan Salahuddin Aiyubi reconqured Palestine and reconstructed the Mosque and Maqaam A Sakhra.And he built a metal curtain around the stone slab as people started to chip away small peices of the stone for Barkkat. 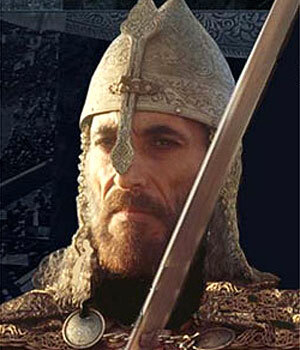 The Turkey Sultans of the Ottaman Empire ruled Palestine until 1928. From 1929 to 1948 it was under British rule. In 1948 the Americans and British and handed it over to the jews the palestines were driven out of their homes and many were martyred. IN 1967 IN THE SIX DAY WAR AFTER ENTERING BAIT UL MUQQADAS, THEY WANTED TO BLOW UP BOTH THE MOSQUE AND MAQAAM A SAKHRA WITH 100 Kgs OF EXPLOVISES. BUT BY THE GRACE OF ALMIGHTY ALLAH THEY WERE DUMBSTRUCK, THEY LEFT HARAM SHERIFF AFTER A FEW HOURS GIVING BACK INCHARGE TO THE WAKF. HOW CAN WE DIFFRENCIATE BETWEEN THE MOSQUE AND MAQAAM A SAKRAH. THEY ARE WITHIN THE BOUNDERIES OF HARAM SHERIFF.THE WHOLE AREA AND ITS SURRONDINGS ARE BLESSED BY ALLAH. THE MOSQUE WHICH WE SEE TODAY IS IN THE SOUTHERN PORTION OF BAIT UL MUQADDAS WAS FIRST BUILT DURING THE TIME OF HAZRATH UMER FAROOQ RAZIALLAH ANHU.AND LATER REBUILT BY OTHERS. 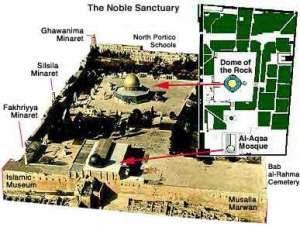 THE GRAND MOSQUE BUILT IN THE ENTIRE COMPLEX BY THE EARLIER PROPHETS WAS DESTROYED BY THE ENEMIES OF ISLAM. MAQAAAM A SAKHRA IS THE CENTRE OF MASJID AKSA(HARAM SHERIFF) IT THE PLACE OF PRAYERS OF PROPHETS OF ISLAM AND THE PLACE OF ACCEPTENCE OF THEIR DUA'S. IT IS THE QIBLA AWWAL. ALLAH HAS BLESSED THE PLACE AND ITS SOURRINDINGS. MUSLIMS DISPLAY THE PHOTO OF MAQAAM A SAKHRA IN THEIR HOMES AND OFFICES (IT IS EVEN DISPLAYED ON OUR PRAYER MATS).FOR BARAKKAT AS IT IS THE HEART OF BAIT UL MUQADDAS LIKE HOW KAABA IS THE HEART OF HARAM SHERIFF IN MECCA MOUIZMA. 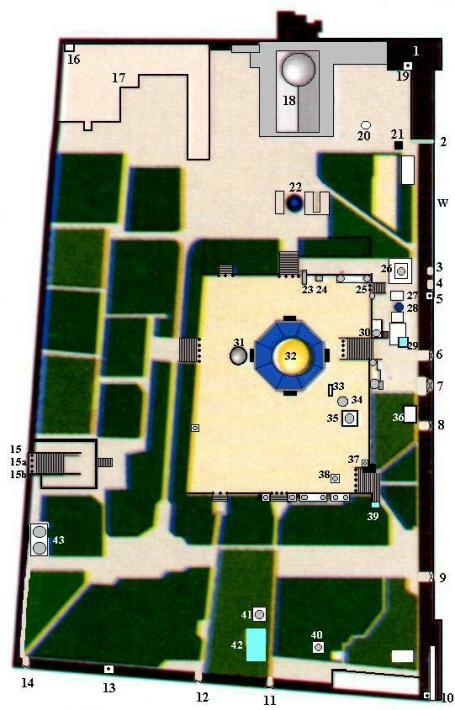 IT IS THE PLACE FROM WHERE THE HEAVENLY STEED BURRAQ ALONG WITH HAZRATH GIBRAIL (A.S.)LEFT FOR MERAJ WITH OUR HOLY PROPHET HUZOOR SALLALLAHU ALHI WA SALLAM. 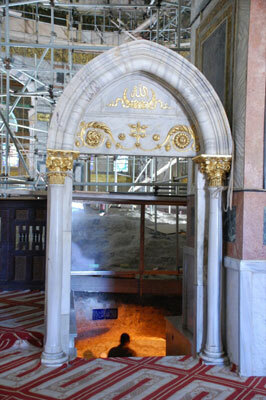 THE MOSQUE IN THE MASJID AKSA COMPOUND IS SLOWLY BEING DAMAGED BY THE JEWS BY DIGGING UNDERNEATH ITS FOUNDATION. SECONDLY IF A NATURAL CALAMITY WERE TO HAPPEN. THE MOSQUE WILL BE REBUILT INSHALLAH ON A MUCH GRANDEUR SCALE. THIRDLY IF SOMEONE WERE TO ''MAZALLAH'' DESTROY OR REMOVE THE MOSQUE DELEBIRATELY, MAY ALLAH BURN HIM HELL FIRE OF THE FIRST DEGEREE. HE IS AN ENEMY OF ALLAH AND ALLAH WILL DESTROY THEM. 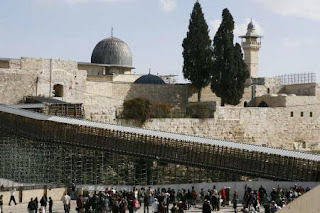 THE JEWS WANT TO DESTROY THE MOSQUE AND MAQAAM A SAKHRA, AND TAKE FULL CONTROL OF BAIT UL MUQADDAS THEY ARE TRYING IN ALL WAYS AND MEANS AND ARE SAYING THAT IT IS THEIR'S KINGS PALACE. 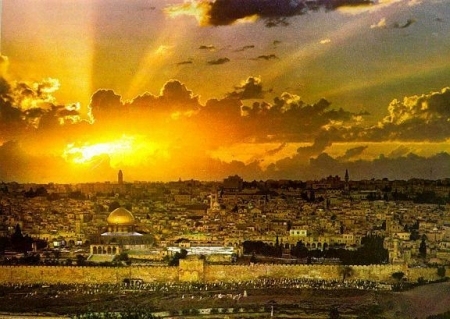 ALLAH PROTECT US FROM THIS SHIATEEN ''AMEEN'' .THE PEOPLE OF PALESTINE ARE FIGHTING TO LIBERATE BAIT UL MUQADDAS. ALLAH WILL HELP THEM AND INSHALLAH BAIT UL MUQADDAS WILL BE LIBERATED ONCE AGAIN. MAY ALLAH FOR THE SAKE OF HIS BELOVED PROPHET MUHAAMMED UR RASOOLAH SALLAL LAHU ALHI WA SALLAM FORGIVE ME FOR ANY OMMISIONS/MISTAKES WHILE WRITING THIS.